Part of the forested Park. Living in a city can have its drawbacks. Too many tall concrete buildings cramped together, no matter how beautiful, will eventually make most of us yearn for some wide open places with trees and flowers where we can commune with nature. In many great cities in the world, parks have been built to add that breathe of fresh air for its inhabitants. Even though we do not consider Kota Kinabalu City to be on the same scale as Kuala Lumpur or Hong Kong, it is still rather stressful to navigate the traffic everyday and live in such close proximity to our neighbors in housing estates. As such we are indeed lucky to have a couple of recreational parks in Kota Kinabalu. 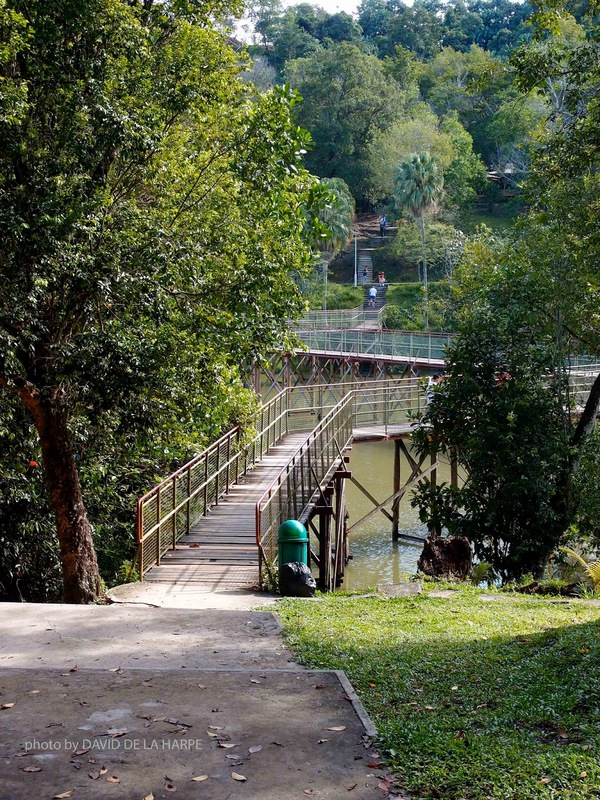 While most of these parks incorporate a lot of concrete features in their landscaping, we have been blessed with a green lung just on the outskirts of the city in the area known as Bukit Padang at the end of Jalan Kolam. Just 15 minutes by car from the City, this park which was originally a reservoir, incorporates a 2 km asphalt jogging path around a man made lake, a seafood restaurant, hawker center, event halls and a water theme park. Luckily these buildings are all concentrated towards the entrance of the park and the rest is an oasis of green. Visitors come in two waves, the early risers from as early as 5.00am in the morning till 10.00am and the 2nd wave comes in the evenings between 4.30 pm to 6.30pm. They come to walk, jog, and enjoy nature and even dance in the park, as there are Tai chi and line dancing classes held in the mornings. The most popular section has to be the undulating 2.1km-jogging path which winds its way on the sides of the hill slopes and across the man made dam. Trees of various sizes and species shade most of the path. Some of the trees like Acacia and Tamarind were planted while others such as the wild tarap, breadfruit trees, tembusu and bamboos are native to the area. Many of the trees are festooned with wild orchids, ferns and trailing hoya plants. There are a couple of streams that flow into the lake, which is home to colorful carp, catfish and tilapia. I have come across box turtles crossing the path and once when the breadfruit tree was fruiting, a troop of long tailed macaques’ monkeys enjoying the fruits in the tops of the trees. I think the monkeys were having some fun as they were throwing the skins of the fruit down onto the jogging path and narrowly missed hitting some of the joggers. Various species of birds have made the park their home together with squirrels, which provide much entertainment to the children, as they scamper along the branches and it is still possible to hear the call of the cicadas as dusk falls in the park. Treckers arriving at the top. 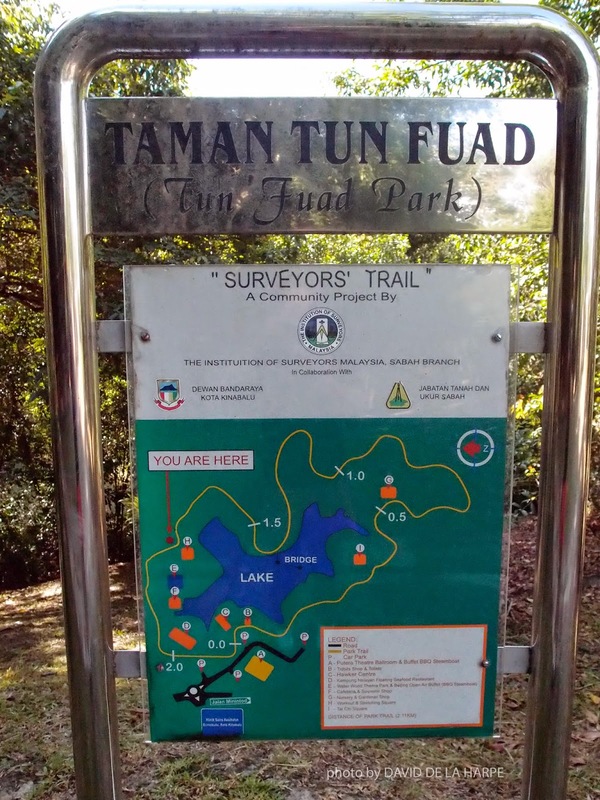 For the more energetic trekkers, there are trails to the summit of Bukit Padang hill that is 447ft high and the distance is about 1km. The trails have steps carved out of the earth with wooden boards and some have been made from recycled car tires. Climbers planning to scale Mt. Kinabalu often use these trails as a training ground. The spectacular view from the top is reward in itself with all of Kota Kinabalu spread out below you. On a clear day you will be able to see as far as Dinawan Island in the South and Mt Kinabalu in the East. To many people, the park is truly a blessing regardless of their ages and physical fitness levels. It provides city dwellers with a venue to stay fit and healthy, family bonding or just to commune with nature. Parking and entrance is free.